Happy New Year! I know I am personally hoping 2014 will be a year of new beginnings and increased happiness … selfishly, for me, but also, of course, for all of us! 2013 was a bit rough overall, but my life so often overflows with love and support, even in the midst of challenges. And I am so grateful for all the good people that continue to make everything worthwhile, personally and professionally. I would not continue to grow and learn without you. I also truly believe a wonderful upswing has begun and is in progress, so this first day of January is a very happy one for me, indeed. I just wanted to take a quick moment to update everyone on some of the exciting projects I am working on in January. I do not believe in New Year’s resolutions, because I fully believe we should always be working to change ourselves and our circumstances for the better — not just once per year. But it is my goal in 2014 to have a regular monthly news post giving a little more insight into the upcoming professional work and personal projects that most excite me. Here goes the first one! A couple weeks ago, I wrote an article for the Musician Coaching site about how musicians can craft effective elevator pitches to promote their music. If you missed it, check out “Writing an Elevator Pitch for your Music” for a few tips that might help you get started. While this is certainly not my own news, I’m excited about the upcoming documentary about Roger Ebert’s wonderful Life Itself. He is one of my professional and personal heroes, and his memoir was definitely one of my favorite books of the past few years. It will be premiering at the end of this month, and they are currently raising funds to complete production through Indiegogo. Definitely check it out if you want to support a worthwhile artistic project that tells the story of a wonderful writer (and human being). Early next week, I’ll be announcing a special discounted press kit-related bundled package for musicians, artists and performers in the New York City metro area that want to present their best selves to the world. I don’t want to give it all away yet, but I’ll be teaming up with another very talented creative professional to enhance my services significantly, and I’m totally thrilled to be able to provide a valuable resource that I’ve never before been able to offer. The promotion will run through February 1, so there will be plenty of time to take advantage. Stay tuned for all the official details on Monday! Here’s to a magical, abundant and pleasantly-surprising 2014! End of Summer Bio Special: 3 Days Left! There are just 3 more days to save 10% on all my professional bio services with the end-of-summer bio special! This special also applies to the bio services I offer to musicians through the Musician Coaching website. The fall is a great time to re-envision and re-energize your profile, so get in touch with me today for more information, including rates and recent samples of my work. The offer expires September 12! How do you feel about your band or artist bio? Maybe it’s been a while since you updated it … or maybe you’re just feeling like the one you have just isn’t serving you well. Maybe it’s because I am the daughter of two teachers, but I’ve always thought of fall as the real beginning of the year, as a time for “fresh starts,” getting organized and embarking on new adventures. So, what better time for musicians to think about what they’re putting out to the world professionally to introduce themselves and their work? In the next few days, I’m going to be announcing an end-of-summer special deal on my band and artist bio services for musicians looking to spruce up that all-important version of their marketing materials. If you’ve been thinking about making a fresh start with your professional profile, now’s the perfect time! I’ve been pretty busy lately working on all kinds of wonderfully-challenging projects, but I wanted to take a breath to jot down some highlights of a few things I’ll be doing in the next month. 1. When checking out music by and fun facts about new (or old) artists I like, I get endlessly frustrated by all those who have bios on their websites, etc. that are not doing them any favors. (And it actually makes me regularly wonder if I’ve missed some really great music as a result of being turned off by a particularly-terrible blurb or bio.) Inspired by my outrage, I wrote an article last week for the Musician Coaching site called Biggest Bio F&*k-Ups that offers a little collection of mistakes to avoid when writing about yourself. Check it out … and enjoy the irreverent photos! 2. I’m co-sponsoring an awesome event on June 12, 6 p.m. at Top of the Garden in Manhattan with some other local businesses and individuals for the NYC Toasted Almonds networking group for professionals in creative industries. It’s my first time sponsoring anything, and I’m excited to be a part of this thriving community that gets together several times per year to shoot the breeze, drink, eat and potentially find ways to collaborate on creative projects. If you are a creative professional of any type living and working in NYC, you should definitely get involved. Their events are always well attended by people that are fun to talk to. (Plus, they’re laid back, so if you’ve had bad experiences with “stuffy” networking groups in the past that don’t feel like a fit for your personality, as I have, you’ll enjoy this.) Event registration is here. 3. In conjunction with the Toasted Almonds June event, I will also be offering a special promotion for my services good through the month of July that will be announced tomorrow on the Toasted Almonds Tiny Couch page. 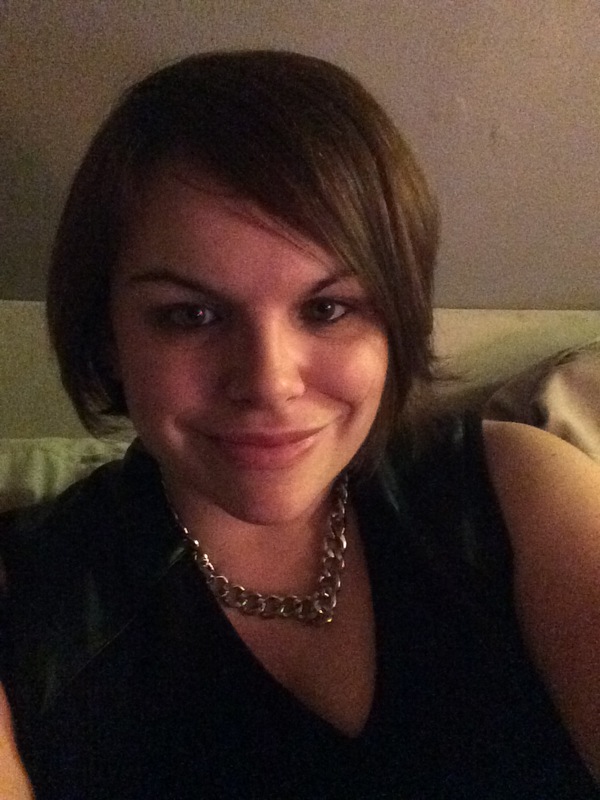 (Tiny Couch is a cool little company that helps people build self-maintainable websites.) Stay tuned to http://toastedalmondsonthetinycouch.com/ for details! That’s definitely enough self-promotion for now! I’m hoping for a little extra time so I can put together a personal post soon! The “Art of Tasteful Boasting” Audio is Live! Presskit.to has made the audio of last week’s “Art of Tasteful Boasting” audio available for all to hear, along with the accompanying PowerPoint presentation. See what you missed us all discuss on the Presskit.to blog! I know the folks over there have a lot more free music-business-centric webinars and panels planned in the future to help artists navigate the increasingly-wooly industry, so I highly recommend continuing to check them out. In other news, I’m learning a lot by doing all these little writing and marketing workshops and am so grateful I keep getting asked. 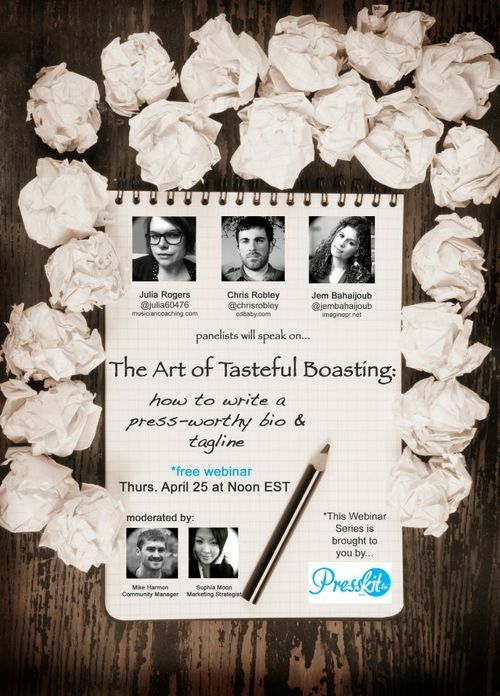 Here’s some more info about an interesting Webinar I’ll be participating in on Thursday, April 25 at 12 p.m. EST — “The Art of Tasteful Boasting” courtesy of Presskit.to with fellow marketing experts Chris Robley of CD Baby and Jem Bahaijub of imaginePR. We’ll be talking about how to write a press-worthy biography and tagline as a musician and the many challenges that come with it and covering topics related to finding your narrative voice as an artist, overcoming writer’s block. There will also be time for attendee questions. Hope you’ll join me! You can register here.